The Bible is full of stories about the evils of hypocrisy, and there are no shortages of examples in the modern world as well. Case in point: the nation’s major insurance companies, which persuade consumers that the policies they buy are a valuable investment. But while the’re doing that, they’re opting to put those policy premiums into a true investment – real estate. According to a new report from Forbes, major US insurance companies are leading investors in real estate and real estate related enterprises such as agriculture. MetLife alone has a portfolio of over $55 billion in real estate, with other large companies such as Prudential and Farmers not far behind. And even at that, the US runs second to Europe, where over half the investors in commercial real estate are insurance corporations. It’s clear that these companies recognize the difference between insurance “investments” and the real thing – real property that lasts, and is always in demand. It’s true that some kinds of insurance policies do offer actual investing returns. “Permanent” life insurance, as opposed to the cheaper limited term life, for example, allows for some investment opportunities from a portion of premiums paid. But the multibillion dollar real estate portfolios these insurance companies hold are derived from misrepresentations and fear. They make their money by persuading people to buy a policy as protection against potential crises — an investment in the future, offering peace of mind and security. Yet the premiums paid to an insurance company, with a few exceptions such as the options offered with permanent life insurance, won’t yield anything resembling a real return on an actual investment for the average policyholder. And it’s the life insurance industry that drives most of the actual real estate investing activity conducted by insurance companies. Those long-term policies with their higher monthly premiums are a major funder of insurance company purchases of commercial buildings, agricultural land, and even residential multiplexes. Real estate has long been recognized as the most stable and secure investment a buyer can make. Land never goes away. And people always need a place to hang their hats – both for doing business and making homes. It’s a way to build wealth with a clear return on the investment, a tangible asset that, even with market ups and downs, remains in demand. 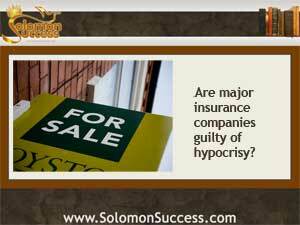 Clearly, there’s a place for insurance, and valid reasons for paying those premiums to protect valuable assets. But those monthly premiums paid for that protection wouldn’t generally return to the purchaser unless disaster strikes – hardly a recipe for smart investing.